In a climate of stretched resources and mounting concern that the housing market is broken and failing to deliver for citizens, the concept of co-production is gaining traction. The idea is simple: to achieve better outcomes, citizens should have a meaningful role in the design and delivery of the homes they need. First termed by Noble Prize winner Elinor Ostrum in the 1970s, co-production has since transformed thinking about the design and delivery of public services, particularly health and social care. 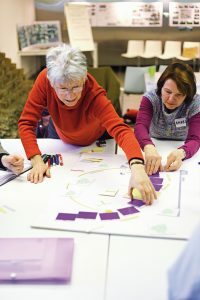 Across the built environment, appetite for new ways of working is growing, but questions remain: what could co-production mean for housing, and what does it look like in practice? 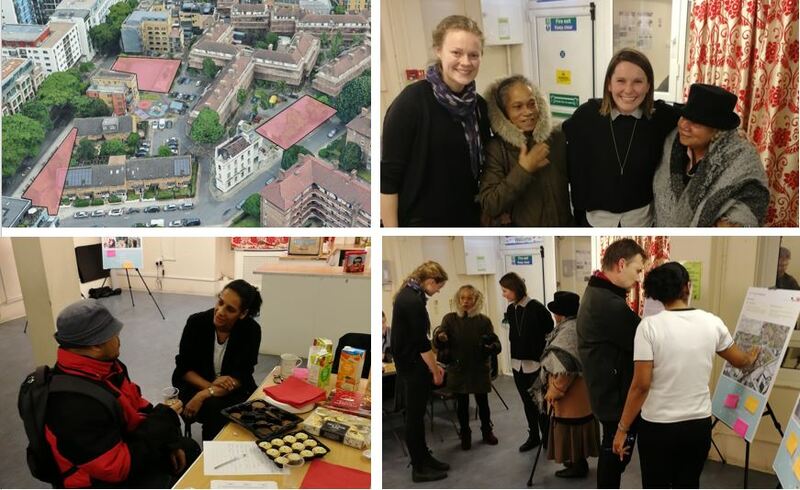 On 25 March, kindly hosted by UCL’s Bartlett Real Estate Institute, the second event of Future of London’s Foundations for Community-Led Housing project brought cross-sector delegates to learn from active examples of co-production in housing and regeneration, and to work out the way forward. A summary of presentations is provided below, followed by workshop highlights and top tips from our speakers. We Can Make is a partnership between Knowle West Media Centre and White Design in Bristol. Listed as one of Nesta’s and the Observer’s New Radicals 2018, the initiative has transformed Knowle West – a low-density, 1930s estate – into a test-bed for affordable, citizen-led housing. A land supply not identified in any allocation policy – 2000 micro-plots, each big enough for a one- or two-bedroom home, all across the 5000-home estate. Where many low-density estates face demolition to make way for new homes, Knowle West understood that existing assets could be the ingredients for opt-in densification. Currently, the estate is under-utilised with older people under-occupying and unwilling to leave their community, and young couples in spare rooms and desperate for space. Drawing on the community’s skills, resources and know-how, We Can Make developed a prototype home, designed for the estate’s abundant micro-sites. The structure was bought flatpack and assembled over 12 weeks by local people. Situated next to the community centre, this tangible project output offers many benefits: locals can stay for free, get to know the space and leave valuable feedback. People from further afield can pay to stay via Airbnb, providing reviews and a revenue stream. To date, 80 families have opted in. In addition to the prototype, We Can Make have developed a community design-code and a supplier’s framework, with a distributed community land trust (CLT) and housing factory in the works. One central rule to all We Can Make is: “low floor, high ceiling”. The goal should be to make it as easy and as simple as possible for everyone to get involved: Don’t underestimate communities or put restrictions on how sophisticated involvement can be. One of the best-known examples of both community-led housing and co-design in London is Older Women’s Cohousing (OWCH) in Barnet. The development was led by a group of 20 older women, determined to not to spend their later years singing “Long way to Tipperary” and not to be “done unto”. Rather, they chose cohousing: A value-based model of mutual support. The scheme was enabled through partnerships with a local authority, housing association and architect. Speakers Patrick Devlin, Partner at Pollard Thomas Edwards and Maria Brenton, Senior Cohousing Ambassador at UK Cohousing and co-founder of OWCH, acknowledge that the degree to which power was shared throughout these partnerships varied. “We need to share the right knowledge for the women to be full collaborators: we hold the pencil, but we want OWCH to guide it”. These ideas are embodied in a scheme that has won multiple design awards and is home to a thriving cohousing community. For more information on the project, please see the case study available via Housing LIN. Even London’s largest social landlord, LB Southwark, have 12,000 households on the council’s waiting list. 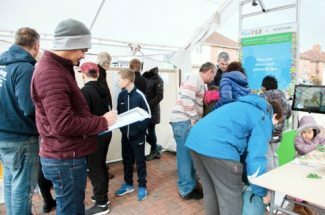 To achieve their ambitious target of 11,000 new council homes by 2043, the borough recognise the need to diversify their approach, ranging from direct delivery to community partnerships. Vital to the latter is Leathermarket Joint Management Board (JMB), the largest tenant management organisation (TMO) in Southwark. Established in 1996, the organisation has a high trust-factor with both council and local people. It oversees services from maintenance to major works across 1,500 homes and achieved 94% approval from residents at the last continuation ballot. Working in partnership with effective TMOs can deliver a range of benefits, including unlocking contentious sites; bringing in additional funding; leveraging local knowledge to ensure development delivers maximum benefits for residents; and encouraging “right-sizing” through the co-design process. LB Southwark supported Leathermarket JMB to establish Leathermarket Community Benefit Society (CBS), a vehicle for delivering genuinely affordable homes for Southwark residents. Speaking jointly, Bruce Glockling, Interim Director of New Homes and Head of Regeneration at LB Southwark and Paul Munday, Co-Chair at Leathermarket CBS, highlighted the partnership’s success in delivering 27 community-led, social-rent homes at Marklake Court in 2018, with a further 100 in the pipeline and a rolling programme going forward. Neighbouring the former dockyards in East London, Custom House has been earmarked for regeneration since 2003, but progress has been slow. In 2013, The People’s Empowerment Alliance for Custom House (PEACH) was established and in 2015 they set up The Alternative Regeneration project, developing a regeneration brief for the area, through a community-led masterplan. 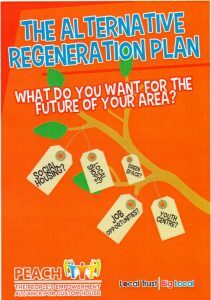 In 2018, with the election of Mayor Rokhsana Fiaz and a new emphasis on putting people at the heart of the regeneration process, PEACH’s aspirations aligned with the local political agenda. Speaking jointly, Sib Trigg, Architect and Organiser at PEACH, and Hannah Lambert, Senior Regeneration Manager at LB Newham, were clear that they stand at the beginning of the process, unpacking what co-production will mean for PEACH and LB Newham. To date, steps have included LB Newham sharing the design tender for the first phase of regeneration with PEACH, leading to feedback, negotiations and the inclusion of elected community representatives on the selection panel for the procurement of the design team. The representatives are paid London Living Wage and PEACH provides structured support and training. Work is underway to set out terms of reference and design a role for the Custom House Steering Group which will oversee the first phase. Normally the council’s role alone, LB Newham are sharing the decision-making power with elected community representatives. The process has not been straightforward, but every teething problem is a learning curve. Conscious that the political and funding climates may not always be so supportive, it’s important to act now to build structures for the long term, including the E16 Community Land Trust (CLT) for the area. In the ensuing workshops, designed in partnership with Maja Luna Jorgensen, Area Manager at Greater London Authority, delegates were asked to think first about assets they could contribute to the co-production of housing or neighbourhoods, and then about actions they could take together. Assets identified were summed up succinctly by cross-disciplinary delegates: “experience, skills, networks and a commitment to positive solutions”. Taking these forward, actions ranged from the creation of internal community-led housing champions within all authorities to more locally specific actions bringing existing groups together. As outlined by Melissa Mean, what all applications of co-production have in common is a focus on the relationships and the interactions. This certainly proved true for PEACH and LB Newham, who used the time to tap into the human relationships underpinning their co-production journey. Workshopping the question: “What are we scared of?” allowed for frank conversations to follow, building trust for the way ahead. Speak the same language: it can be a struggle for built environment professionals but do strive for plain English! Understand and agree the level of co-production aspired to. It is a spectrum, what is the group’s capacity and goal? Build in time between meetings for new information to sink in. Come up with ideas together: no one should come to the table with final options, everything should be open for discussion, evolution and development. Align timescales and be realistic about pace: better to agree a longer timeline and stick to it than to stop/start. Be clear about who holds decision-making power and be open to new ways of working. Be open and transparent: progress will be smoother if everyone’s aware of who is responsible for what, and how different organisations work. Who’s the client? When it’s a group of people trying to build something, consider whether everyone is the client, or whether this is delegated, and through what process. Keep discipline within the group and be realistic: you can’t have 27 kinds of doorknockers! Keep shared goals in focus and maintain consistent communication with partners. Think about the intangibles: trust is hard earned and easily lost. Think about the commons: what can you share or pass on? With co-production, the clue is in the name: create something! 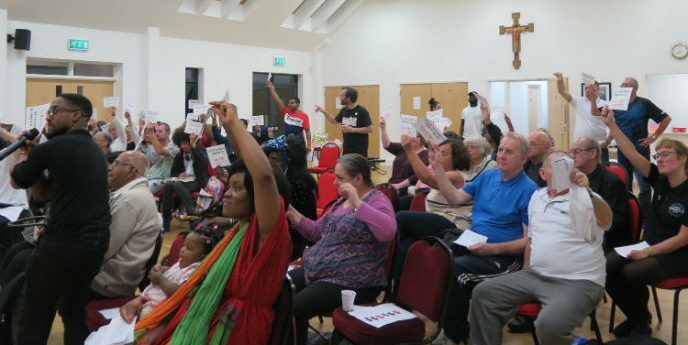 This workshop was part of Future of London’s Foundations for Community-Led Housing project: a six-month programme of interactive events and action learning helping CLH groups and delivery partners to work effectively together. Find out how to get involved on our project page.